WinPatrol is an all-purpose utility designed to increase the performance and usability of computer. It also as a robust security monitors application which monitors all the critical changes to computer systems without the user permission such as malware or spyware being installed. WinPatrol takes snapshot of the critical systems resources and alerts user if any change to the systems without their knowledge. Auto detect and approve or reject new startup programs. Delay startup programs for faster boot time. Search cookies on the computer and delete unwanted cookies. View and Kill running processes if found the programs should not be run. Monitor and edit the HOSTS file. 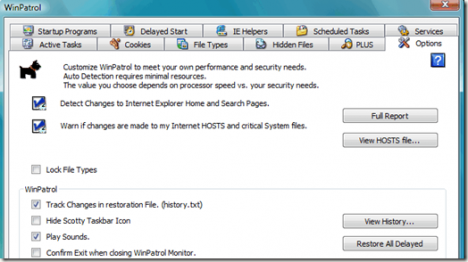 Monitor Internet Explorer tool bars and remove or block unauthrozed toolbars. Monitor either start or stop windows services. Monitor and prevent changes to file type associations. Find hidden registry keys and modify it. Manage ActiveX controls and components. Currently, WinPatrol is free to download and the user can upgrade to WinPatrol Plus if they request to add more features such as knowledgebase, support future WinPatrol development and anti-malware research, real time infiltration detection and etc. WinPatrol Plus membership is a one time purchase cost for $29.95 per user.